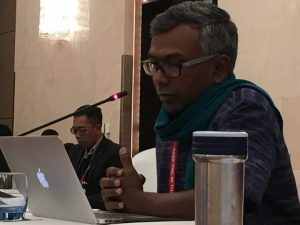 My name is Kannaiyan Subramaniam, I’m a small farmer from Tamil Nadu, India and representative of La Via Campesina, an international peasant movement with members in 81 countries, 182 farmers Unions comprising of over 200 million of small scale farmers families including agricultural workers and indigenous people. I come from India where farmers are suffering due to crashing prices, import surges, land grabs, ever increasing cost of production and import driven crop pattern changes that put farmers in deeper and deeper crisis. As a result, more than 300,000 farmers have committed suicide after India committed to WTO policies of free trade. As time is very limited, I will give few examples from my country on behalf of the farmers’ union. Among the several million small and backyard dairy farmers producing milk in India, 95% are women. This is a mass production by the masses not by few big corporations. The income generated from dairy, is predominantly spent by women for welfare of the family. My own education is the result of hard work put in by my mother, who reared buffalo and cows. We have an impressive network of cooperatives, domestic private players, individual milk sellers, who together with the farmers made the country self-sufficient on milk. This is an excellent model that should be replicated in other developing countries. But, RCEP is expecting member countries to slash the tariff to zero including for dairy. If India commits in RCEP that will bring disaster. RCEP will probably wipe out the small and backyard dairy farmers, and that will be nothing short of a suicidal step for a country that is self-sufficient. I’m not being an alarmist here, but I’m expressing our anguish based on our country’s experience in the case of edible oil and pulses. Two decades ago, we started importing edible oil in very small quantity, but now India is depending more than 70% of edible oil from the imports coming predominantly from the countries like Indonesia and Malaysia. As the results farmers who produce edible oil are forced to be out of the production. Similar cases with pulses – in 2013 it was 38% and now it is more than 52% of what we import from RCEP member countries such as Myanmar and also Canada. I would also like to highlight how in the middle of climate crisis that we are facing today, farmers need more diversity in our fields. And we can’t do that if RCEP prohibit our knowledge and ability to breed, save and exchange our seeds freely. India is not a member of UPOV 1991, We have our own Protection of Plant Varieties and Farmers Right Act, 2001 that protects our own-farmers seeds. Under this Act farmers are entitled to save, use, sow, re-sow, exchange or sell their seed. Our public sector breeders and universities also produce high-quality and affordable seeds for the farmers. Compelling the negotiating countries to be members of UPOV 1991 is an assault to biodiversity. It only gives more profit to seed companies, further burdening us farmers with higher costs of production, as our rights to keep, exchange and breed seeds for the next season are restricted or banned. This could further aggravate farmers’ debt due to high price we have to pay for seeds, and in India this could mean the death of farmers. The governments have done mistake in trade negotiations, for example in WTO we have agreed to Agreement of agriculture (AoA) so that developed countries will reduce their subsidies and farmers in developing countries will benefit. But that never happened; import surges increased and deepened the crisis in country side, resulting in farmers’ suicide. I would like to caution the negotiators particularly negotiators from India, Thailand, South Korea and other RCEP countries not to repeat these mistakes by continuing with this trade negotiation. At least in WTO, the text was open for the public but here you are negotiating secretly which is against the fundamental principles of democracy and undermining our life. The commitment in RCEP will eliminate the policy space for governments to protect their farmers. Governments will lose their sovereign rights and we, farmers will lose our food sovereignty. So, I very humbly request all of you of 16 governments to discontinue this free trade negotiation and build the trade based on cooperation.